How can we conceptualize China through and beyond, rather than despite, accelerated change? What are China’s contours as a region of ethnographic research in a globalizing world? Anthropological efforts to ‘localize’ ethnographic regions – or ethnographic alterity – always had to grapple with questions of change and continuity in time and space, as well as with the issue of explanatory concepts and their ability to travel (see Fardon 1990, Fabian 2006). The goal of this workshop is to rethink China by “localizing” social forms or processes that allow for “socio-cultural continuity within change” and “socio-cultural change within continuity”. Thinking socio-cultural reproduction – or stability – through time together with the “freedom” to realize change, also radical one, is a theoretical challenge which the discipline as a whole needs to tackle (Robbins 2007). This task appears most pressing in the case of China anthropology and its “subject civilization”, for two observations: First, China as a socio-cultural formation has historically stretched over vast disjunctures in time and space, and, most importantly, as a civilization it has embraced radical change in all areas of life in the last hundred years. Second, China is today one the fastest growing ethnographic regions, yet, as Frank Pieke (2014) points out, not because of China anthropology’s theoretical contribution to the general discipline but rather because of China’s new global importance. Maurice Freedman’s suggestion that “A Chinese Phase in Social Anthropology” (Freedman 1963) would be driven by methodological-theoretical innovations – that faced with complexity of what we call “China”, anthropology would need to learn how to study a “civilization” – still awaits formulation as a collective project. The workshop proposal rests on the assumption that there is a non-trivial link between these two observations. 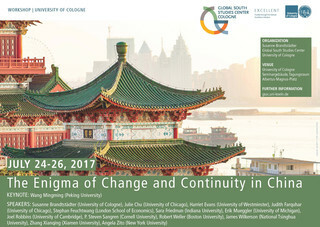 Most importantly at the current historical juncture, where some scholars describe radical cultural breaks and others insist on China’s uniqueness, a focus on formative social processes and world-making practices can transcend the enigma of change and continuity in China. A globalized China endorsing accelerated change (towards ‘modernity’) is precisely the place to study civilizing processes that involve enough “continuity” to create sociality and enough “freedom” to allow for radical change.